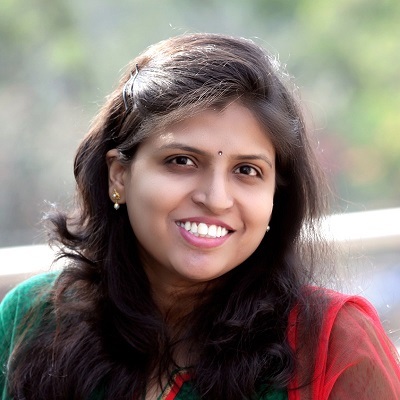 Moms of infants are fine till they hit the 6 month milestone – and then the confusion begins!! 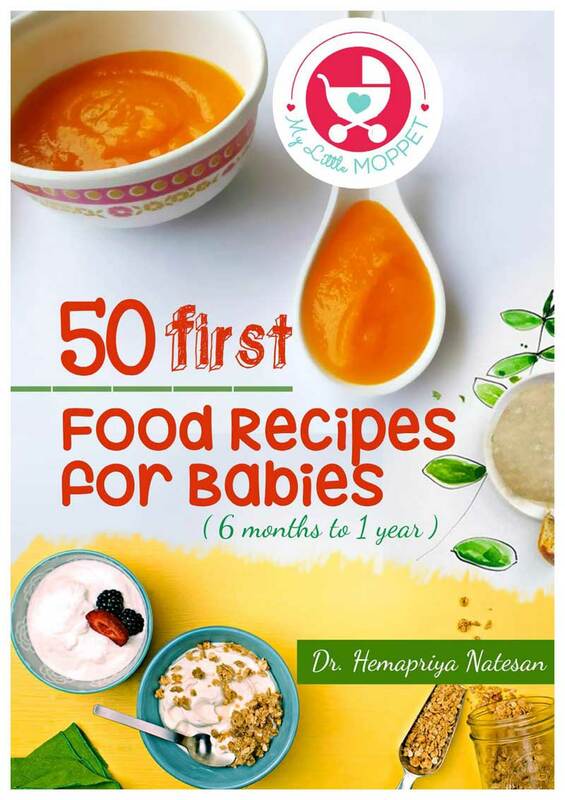 Moms’ questions about what to feed their babies and what to stay away from could fill a book! But all these questions are valid ones considering an infant’s digestive system grows rapidly till the age of one year and each month has a different dietary requirement. One of the most common questions regarding babies’ diets is that of feeding a baby cow’s milk. No sooner has that confusion died down than the next one pops up – why is cheese or cottage cheese okay when cow’s milk isn’t? That is an important question and we’ll get to it right away! 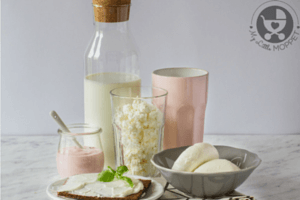 ‘No’ to cow’s milk but ‘Yes’ to cheese, paneer and curd – Why? 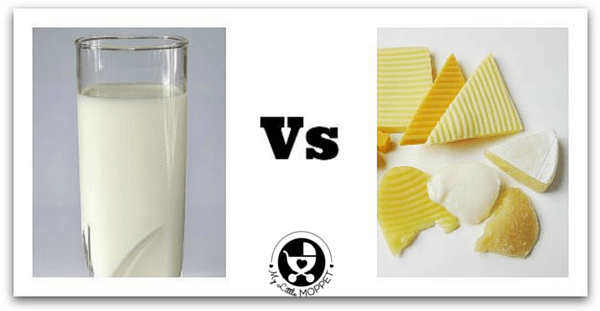 Even though cheese and yogurt are made from cow’s milk, they are structurally different. In cheese and yogurt, lactose is broken down to smaller protein molecules by the curdling enzymes, making it easily digestible. Besides, no Mom would think of replacing breast milk with cheese and yogurt!! 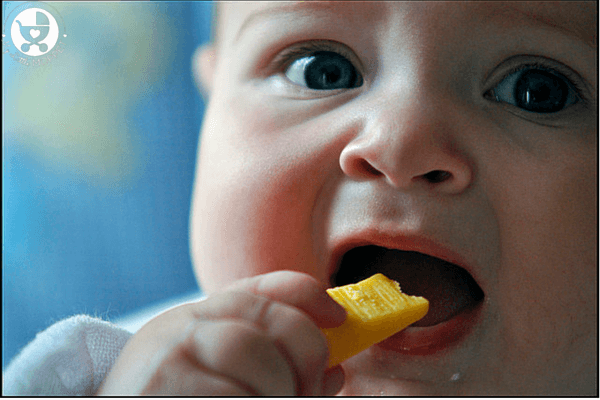 If your baby has a milk allergy or lactose intolerance, then it’s better to avoid all dairy products including cheese, curd and paneer till 12 months of age. 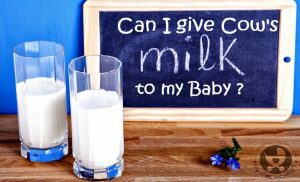 Some experts argue that since the lactose is broken down, these foods are safe, but with a young baby, it’s always better to be safe than sorry. 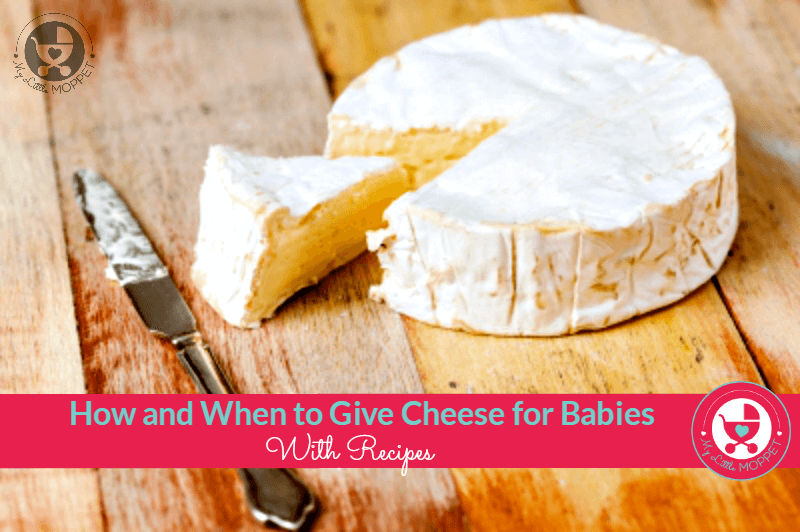 Cheese can be introduced even by 6 months of age as per the current WHO recommendation, although traditionally it was advised to introduce cheese between 7 to 8 months of age. What kind of cheese can be given to babies? It is best to introduce our own paneer or Indian cottage cheese. Always use homemade paneer or get it fresh from a good hygienic local vendor that you trust. Avoid any kind of cheese with mold, such as blue cheeses. 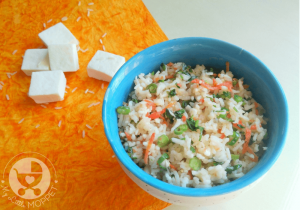 A small cube of paneer is enough for a 6-8 month old baby and as the baby grows, you can feed him a maximum of 2 to 3 small cubes, 3 to 4 times a week. Start small and watch out for any reactions to the cheese or paneer. 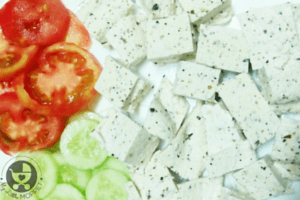 Paneer is a rich source of animal protein available at a comparatively lower cost than meat and forms an important source of animal protein for vegetarians. Over and above its high protein content and digestibility, the biological value of protein in paneer is in the range of 80 to 86 . In addition, paneer is a valuable source of fat, vitamins and minerals like calcium and phosphorus. 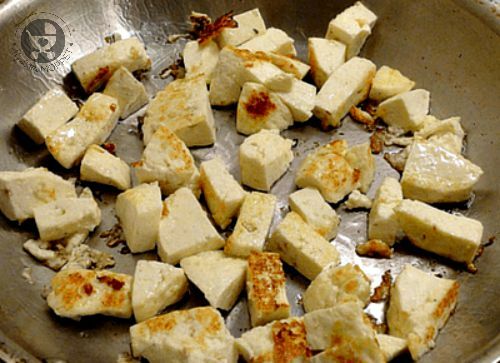 Cut homemade paneer into small cubes and saute them lightly in ghee. Then cut again into small bite-sized pieces that the baby can hold and eat as finger food. If your child has no problem with cheese or paneer, it is still possible that she may have an intolerance to milk. 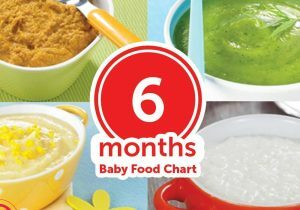 So do follow the regular rules for introducing new foods when beginning milk for your toddler as well. Till then, let her enjoy the protein in cheese and grow big and strong! Yes, paneer can be given for 9 month old baby. Complete details and recipes are given in the above article dear. Can we give just crumbled panner to 1 yr old, like topping the crumbled panner over the food..
And when and how can we start giving milk?? My son is 1 yr 1 month old.. It is better if you could roast the crumbled paneer and then feed it to your toddler. The baked/roasted paneer will add a nice crunch and taste to it. You can start feeding cow’s milk to your toddler daily 250-400 ml per day in 2 servings. 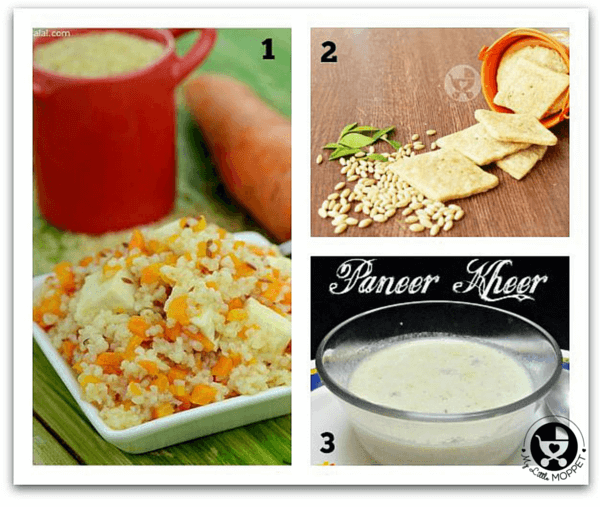 You can add health drinks in it, dry fruits powder, golden latte milk,milkshake,smoothies. Egg you can feed the whole egg to your toddler. You can feed it as hard boiled egg,scrambled egg etc. 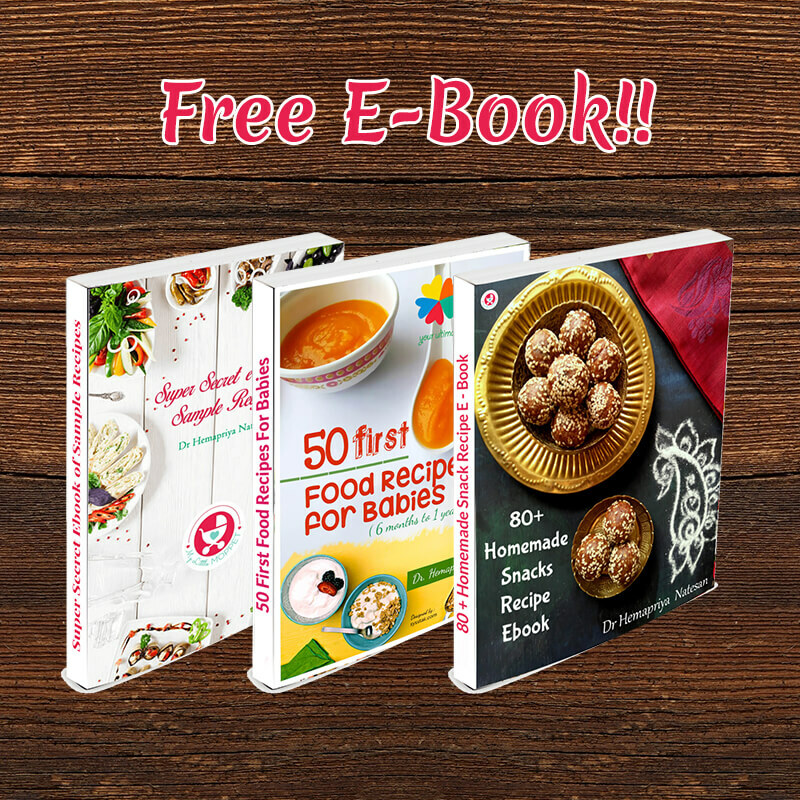 There are some of the egg recipes in the given link that you can try feeding it to your little one. Hello Dr my baby is going to complete 8 months still I’m giving completely mashed food in the food processor(like paste)..I’m scared to give her semi solid food like wen v make it with d hand masher..can I start giving her semi solid food now??? Dr Hema can i give my 11month old a slice of maul cheese slice in her food? You can avoid that for now and start once the baby turns 1 as the salt content is there. Yes dear, you can give cheese.  Here are some recipes https://www.mylittlemoppet.com/?s=cheese. Please give according to your little one’s age and always start with small portions. Yes dear you can give cheese. 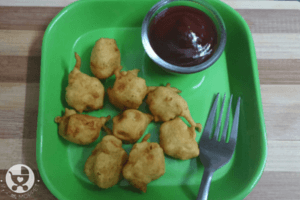 https://www.mylittlemoppet.com/easy-cheese-corn-balls-recipe/ or you can give with soft paratha. Dr Hemapriya my daughter is having patchy skin under the eyes now a days .she is 1yr old and has lots of food cravings .iv given a dose of antiworming but still its not going. Secondly, what is the age of your daughter, appetite is an individual specific matter and hence what may be enough for one child could be less for another. My baby is 15 months old. I’m giving processed cheese to her.Can I include processed cheese daily. If not suggest some brand or type of cheese to feed her ?? How to add cheese to her diet ?? Presently im giving potato with cheese . She is bored of eating cheese with potato ..Can yu suggest some dishes or fruits or porridges to add cheese over it ?? Yes, you can start giving in small quantities. Today I have given my 7 months old baby amul butter and later I read here its not safe. I am now scared, my baby will able to digest it or not. My baby is 8 months old. Can I give her Amul cheese? Is it safe?